Your custom self-inking return address stamp will be personalized just for you! Perfect for adding an extra special touch to invitations, holiday cards, letters and packages. Makes a memorable gift for an engagement, wedding, housewarming, or that hard-to-shop-for friend. Check your spelling carefully (please don't abbreviate). Font, capitalization & layout will be formatted as shown in sample photos. We may use abbreviations such as St or Apt depending on best visual fit. If requested, your proof will be created within 1-2 business days. You will have 2 business days to request changes before your stamp is made as shown in the proof. Your stamp will be shipped to the address on your Amazon account. Stamps are made within 1-4 business days. We use USPS with tracking. If you have any questions about this product by InkMeThis Calligraphy & Engraving, contact us by completing and submitting the form below. If you are looking for a specif part number, please include it with your message. Personalized wedding stamp. 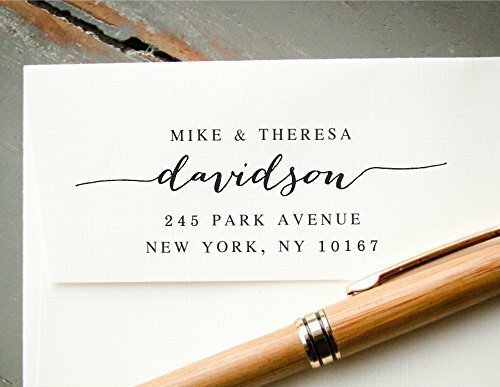 Custom stamp with your names and wedding date. Crown flower pattern. To customize your letters or thank You Cards.